In every build, in every piece of a build, there are a hundred little decisions you have to make. The pressure is on to make good decisions at every bend because if you don't the overall work can suffer. Good decisions are an essential part of good woodworking but how do you tell a good decision from a not so good one? I cringe a little when I look at the woodworking book section of my local Barnes and Nobles because a third of the books there refer to woodworking "done easy" and that's a shame because being good at woodworking is hard. It takes a lot of time and dedication. After reading that you might think I have something against beginning woodworkers, and you'd be wrong. I remember starting myself and all the poor decisions I made. (buy me a beer and ask me about the pencil post bed debacle) But what's missing for many of those would be apprentices is some perspective. The idea that learning is a linear process, that you have to build one mastered skill set on top another, that knowing how to build a picnic table from 2x4's does not translate into being able to build a highboy. You can pull off a highboy shaped object, but not a real highboy. Not one done well and done right with all the right decisions made at the right times. There has to be more in between the two, and I think our modern society doesn't understand that. Highboy on display at the Chazen museum of Art in Madison Wisconsin. Without anyone to tell me, it took half a dozen years of making sawdust before I realized that though I had made stuff from wood, I was not a woodworker, I was closer to a child who has made mounds of sand on the beach and then imagines they are magnificent castles.Once I realized that, I knew I had a long way to go, but I still wanted to make the journey. Hell, I needed to make the journey, and I am still on that journey. Here on this blog I get to record the steps of my journey, and if I go back and read where I've been, I'm proud of how much I've grown. The thing that nobody says in those books for beginners is that anything worth doing well takes time and dedication. In our world of instant gratification that's a tough horse to sell. You've gotta put in the hours, so when you make one of those hundreds of decisions, you have the experience to know what will "most likely" work well, so your piece will "most likely" turn out satisfactory. I say "most likely" because the interesting thing about woodworking is that there are no guarantees, no matter how much experience you have, each piece is a journey. 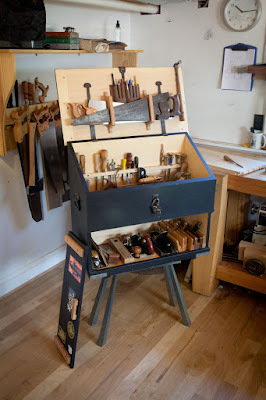 I started writing about decisions because as I work on my version of the William and Mary book stand that Chuck Bender wrote about in the November issue of Popular Woodworking, I have my own set of decisions to make. In the original piece, and on Chuck's version, the corners of the frame were joined with one single stout dovetail. As I built my failed attempt earlier this year, I used that single tail without thinking about it. When it was time for this rematch I decided that one of the mistakes made was letting the cut list and measured drawing I had from HERE make decisions for me. I have never been good at follow the leader. Things work better when I use pieces as inspiration rather than a strict blueprint. (One reason I am a better woodworker than I am a carpenter) I don't even follow the exact recipe when I make Mac 'n' Cheese from a box. Me being me, I have to make my own decisions and then I can stand or fall on them, and I can deal with that. It took a while to decide to bypass the single dovetail. I cut some test joints and I looked at them from different perspectives. I actually kind of agonized over the decision divert from the original, but in the end I decided on a pair of tails over the single. After I finished cutting all the corners I dug out the failed attempt from the back corner of the shop to get a look at both of them. The twin tails just feel better to me, and as far as the look of my work, no contest. I almost didn't put up this picture because of the gaping in the oak attempt. I've done a lot of dovetail cutting this season and practice makes perfect but I believe another big factor is my purchase of an incredible quality dovetail saw from Mark Harrell over at Bad Axe Tool Works. A quality too can make the difference, another lesson I've been learning. The sticky question is, has the saw made dovetail cutting easier and there fore I get better results, or is dovetail cutting just that much more enjoyable so I tend to cut them more and the practice equals better results? In the end, did I make a good decision? That's not a question I can answer yet. The important thing is I made a decision and that there are lessons to be learned from each decision. Well explained, Derek. I'm. With you in preferring your 2nd attempt. The big thing for me was to actually have the patience. When I fumbled around before, I would not take the time to do it right. I would try to rush through just to get it done. I was not enjoying the process. I finally realized, if I was not going to enjoy the process of building something, I would be better off buying it. 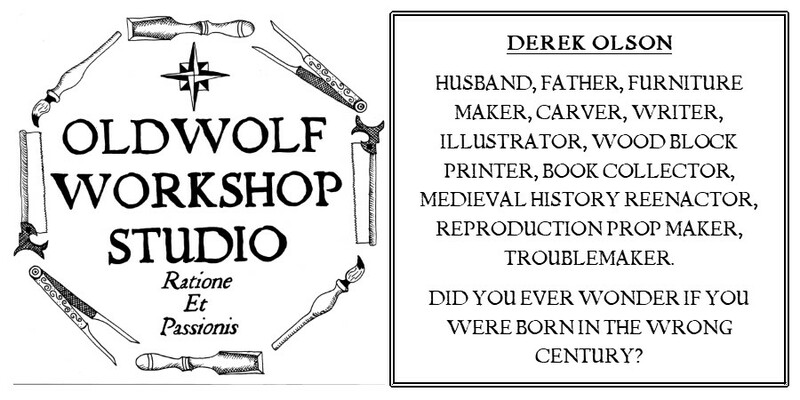 I have to disagree with you on the "six years and still not a woodworker" thing. As soon as you start dorking around with wood on a semi-habitual basis, you've made the change from non-woodworker to woodworker. And after that, the change that occurs is that you become a more skilled woodworker. You know Brian, you have a very good point. In retrospect I may have worded that a little stronger than I meant to. I do appreciate what people of all skill levels bring to the table and I certainly didn't want to sound "elitist" at all. I would have been more acurate to say that my efforts of the first six years were frustratingly miguided by the notion that fine furniture can be built easliy by anyone. And I have since learned that it takes a significant amount of time and dedication to reach a higher plateau. The post itself is a little reaction to a conversation I had with a good friend a while ago. I explained the potential selling price of a piece I had made and his response was to the effect of "who would be dumb enough to pay that. Hell you can build something like that yourself"
I was pretty much left speechless in the wake of that comment and I've been trying to decide for a long while what the best response should have been (as opposed to changing the subject). This post followed from that area of my thoughts. I certainly consider myself still a student of woodworking stuck somewhere between journeyman and apprentice. I know just enough to know I have a lot to learn and that self actualization is where I drew the distinction, for myself, between being a woodworker or a guy who makes sawdust. But again Brian, thank you. Regarding handmade artifacts and "who would be dumb enough to pay that"? Well... look at what the people "smart" enough to buy super-cheap imported furniture also are dumb enough to buy. This guy is not your target audience, and his words regarding the spheres of woodworking and marketing of such crafts are most deeply irrelevant. Maybe someday he will "get it" but you are probably wasting breath. Such a person is probably also likely to feel they are saving money when buying low-quality food, electronics, etc. Once a person has found the value in items crafted with skill and passion in any area of life, its very difficult not to transfer this respect to others. I think most people who have never done woodworking don't appreciate what it takes to make fine stuff. Most things in life are like that. And like most things, it is possible to be a specialist in one area. For instance, I might be the world's premier woodturner (I'm not), but unable to carve a decent panel (I am). And yes, to do fine furniture right or reasonably close, it takes practice and knowledge. To make it quickly, takes far, far more. I think one of the points to be made is the differentiation of a woodworker and a wood assembler. Not a matter of power tools vs. hand tools. The difference is just cutting out parts to make something fit together is not really woodworking. When you use the properties of the wood and start taking advantage of the grain for aesthetic and structural reasons you go beyond just putting stuff together. I will use Derek's project here as an example. The first time around, he was just following a recipe. He wasn't calling the shots. It was much like putting together a kit from Ikea. The pieces just were not as complete. The second time around, he was making an interpretation of the original design. He made the decision to change the joinery, he was choosing the stock for grain and looking beyond what were in some instructions. He stayed close to the original dimensions but if you look carefully, they are different. Many people don't go beyond reading plans and following a cut list and an assembly schedule. It is not a bad thing, but it is not the same thing. It is rewarding in it's own right. When you start designing your own pieces and taking responsibility for the piece's success or failure, you are working at a different level. Wow David, I feel a little flattered. Thank you. As far as what my friend said, we've been best friends for 20+ years by now, and it was his knee jerk reaction that took me by surprise. He's done a fair amount of carpentry work and is generally a DIY kinda guy, and I think at the time we were talking, he really didn't get what work goes into a piece. Since that time I've been doing these Medieval woodcarving demonstrations and he's been around and he watches what I'm doing, pretty closely, and the way he's talking about what I'm doing, in a short while, he's beginning to get it, he's beginning to understand. As far as ignoring someone because they're not a target audience, I guess I have to disagree a bit, I'm all for just moving past the nay-say-ers but first I think we have to take a chance to educate those folks. If they reject the education and carry on their path, then what the hell can I do about that. But if I can do something to get people thinking about it, they might not realize it today, but maybe I get to plant the seed, and a ways down the road maybe those folks become my audience, become all of our audience.